*mounted combat not confirmed, as far as I know. Maybe they’re particularly stinky turds and only someone of your legendary constitution can withstand the stench long enough to collect them? It does seem a little silly… Ranks up there with having a Jedi kill ten rats. Clearly he’s either never heard of you, or none of the other hobbits are willing to do it and he’s willing to foot the substantial bill to hire a legend like yourself to go poo-collecting. He has trouble collecting his own, what with being rooted to the spot and unable to move. How he will use it with that disability is another question. Luckily, the quest is repeatable. LOTRO seems to have an extraordinarily excessive number of such quests. Other games have them, but the LOTRO devs seem to revel in sending “heroes” off to do the most idiotic and/or demeaning tasks imaginable. Honestly, I skipped that quest hub, the quests from the ranger camp nearby were interesting enough, but when I got to the hobbit village, took one glance at the quests, it was kill 10 of that, pick up 10 of this, collect 10 of that, and thought better of it. 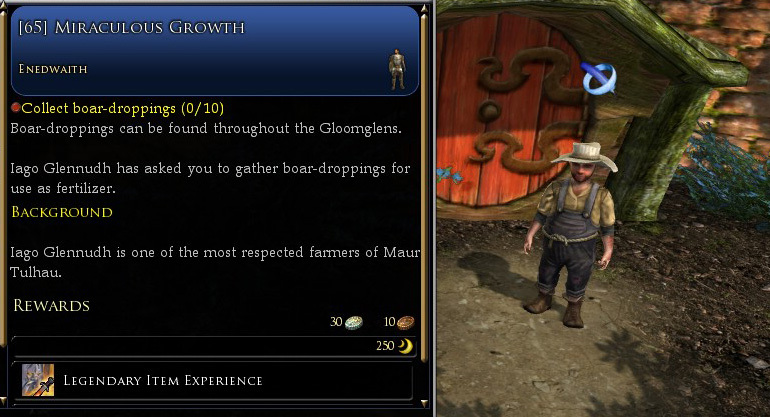 I think the devs thought the players might enjoy the ‘whimsy’ of it, there is even a hidden deed to repeat the boar dropping quest for an apt decoration for your lawn. 1. The existence of a “lost colony of hobbits”. 2. Said hobbits voluntarily bringing themselves to the attention of large men in armor. Compared to those two giant stumbling blocks, being asked to help the hobbits gather fertilizer seems almost reasonable. It actually starts out pretty humorous. You happen upon a hobbit lying there at the town gates. So, it really is a lost colony of hobbits believing you are there for the purpose of helping them.